At Agile Coach Camp 2012 here in Ottawa, I led a session called "I'm done with Agile". The discussion during that session focused on how the marketing of various 'brands' had fractured the Agile world to the detriment of people and organizations who were trying to become more effective at their software delivery efforts. I don't want to burn down the temple, I just want to throw the merchants out! Religion and the politics of the Agile community aside, what the people in that session didn't know was that I really did feel that I was done with "Agile". I had grown so terribly disenchanted with trying to help organizations that were either beyond help or simply weren't ready for the kind of changes needed. Yes, there were some bright spots - most of which I didn't realize until later - but I was literally and figuratively tired of working so hard and seeing so little progress. At that point, I had left the coaching/consulting world and had taken a full-time position at Shopify. Here was a young, vibrant, successful organization that was the antithesis of many places where I had coached. They were being an agile company vs. trying to do Agile. My role at Shopify was effectively an internal coach, but I wanted so little to do with anything 'Agile' that I came up with 'Sherpa' for my title. So, I mostly dropped out of the Agile community. I stopped attending Agile Ottawa events, and left the organizing group. I blogged very rarely. I was still active on Twitter, but much less so about agile topics. During my time at Shopify I watched a group of about 100 people in the development capacity ship software consistently, with many production deployments a day. Testing was taken seriously, product management worked closely with the developers, and everyone strove to keep improving. It wasn't perfect, but it was a damned sight better than most places I had coached. What I realized during that time was that teams weren't using an Agile process like Scrum or XP (out of 20+ dev teams, no two used the same process), but they were being quite effective at shipping software. That word effective is the key - if you follow Scrum or XP to the letter, but aren't shipping what the consumers of your software need when they need it, you aren't being effective! When Shopify and I mutually parted ways as an internal coach, I decided that I was ready to return to the Agile world. To beat the religious metaphor once again, I would be the prodigal son returning. This time, though, I have a different perspective. While I do believe that XP is a great process and my default way of building software, I'm much more aware of what's effective in the context of a team, the organization in which that team exists, and even the technical environment the team has. I don't want to teach Agile, I want to teach effective. You won't see me with the letters CST, KCP or SPC after my name. I'm not interested in tying myself to a brand or spending ridiculous amounts of money for certifications. I'm interested solely in helping people, teams and organizations become more effective at delivering software. So interested, in fact, I'm writing a book about it! Being effective is what truly represents the values and principles of the Agile Manifesto, and is a return to the roots of the Agile movement. 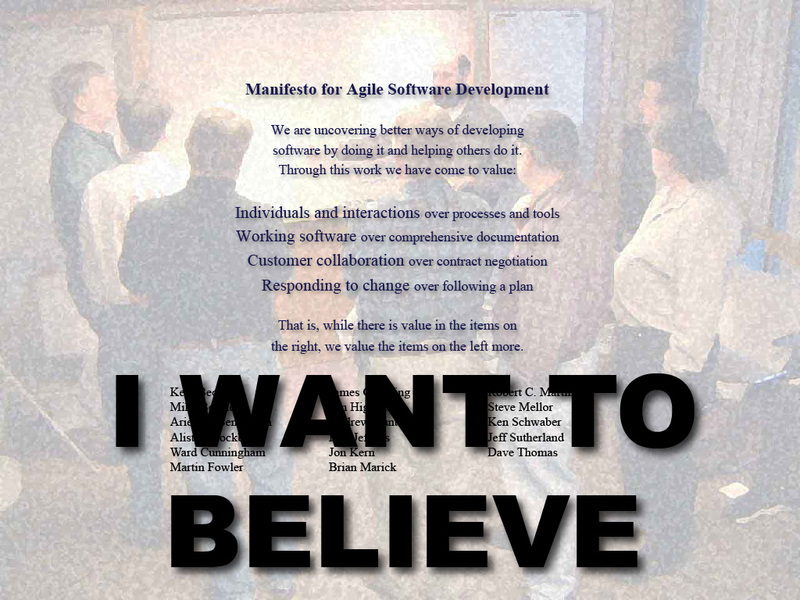 As Tim Ottinger says, "I want Agile back." So do I... I want to believe. The Agile Store Has Been Launched!